PAR (Photosynthetically Active Radiation) is the energy source required for photosynthesis, created by photons in the wavelengths of 400 to 700nm. The energy source, PAR, is expressed in Photosynthetic Photon Flux Density (PPFD) units, µmol m-2 s-1. PAR can be measured from both sunlight and electric light sources to ensure corals are receiving proper light or photons for optimal health. 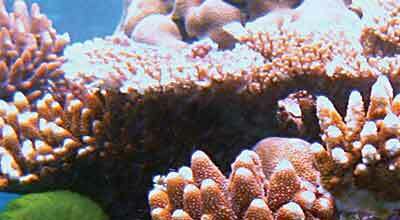 PAR requirements of coral varies greatly due to different depths and water conditions they naturally exist in. Information on specific coral PAR requirements can be found by asking a professional aquarist becoming involved in a local reef club and through articles such as Photosynthesis and Photoadaptation by Sanjay Joshi. Apogee Underwater Quantum/PAR meters and sensors accurately measure an aquariums range of PAR to give a better understanding of aquarium lighting; more details on underwater PAR measurements. Features an improved detector that provides excellent measurements under all light sources, including LEDs, right out of the box. The full-spectrum quantum sensor has a spectral range of 389 to 692 nm ± 5 nm seen in graph to the right. The sensor is available attached to a hand-held meter that provides a digital readout (MQ-510), with USB communication and custom software (SQ-520), and in multiple analog outputs to be used with a datalogger or voltmeter. A lower-cost option that is excellent for all light sources, except most LEDs, where post-measurement correction factors need to be applied to achieve accurate readings. The original quantum sensor has a spectral range of 410 to 655 nm seen in graph to the left. The sensor is available attached to a hand-held meter that provides a digital readout (MQ-210) and in multiple analog outputs to be used with a datalogger or voltmeter. All Apogee Underwater Quantum Meters and Sensors models (MQ-210 and -510, and SQ-420 and -520) automatically correct for the immersion effect or have an immersion setting, allowing the user to make excellent underwater measurements right out of the box. Sensors feature a waterproof sensor head that is potted solid for a complete seal and to ensure it has no hollow cavities for water to penetrate and cause measurement errors. The MQ-210 and -510 meters record up to 99 manual measurements. In logging mode the meter will make a measurement every 30 seconds. Every 30 minutes the meter will average the sixty, 30-second measurements and record the averaged value. The meter can store up to 99 averages. The SQ-420 and -520 USB sensors have internal memory capable of storing 10,000 user-specified periodic measurements that can be downloaded to a computer. PPFD measurements over plant canopies in outdoor environments, greenhouses, and growth chambers, and reflected or under canopy (transmitted) PPFD measurements in the same environments. Quantum sensors are also used to measure PPFD in aquatic environments, including salt water aquariums where corals are grown. The AL-120 Solar Mounting Bracket with Leveling Plate facilitates mounting the sensor to a mast or pipe. The AL-100 Solar Sensor Leveling Plate is designed to level the sensor while sitting on a flat surface or mounting to a surface.